A few years ago I became intrigued about bog gardens in that they allow you to grow exotic plants that one would normally only find in a pond. As bogs are mud and not water they do not carry with them drowning hazards for children and animals nor do they become breeding grounds for mosquitoes (if the bog garden is properly designed and maintained). I built my first bog garden in Southern California and it turned out great. However before it could really take off we moved to Northern California. 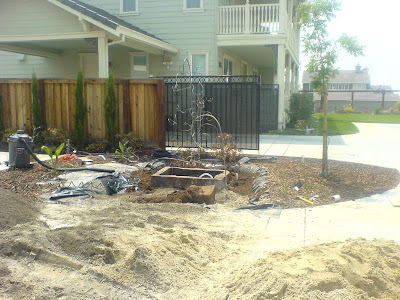 The good news is that my new home had a perfect place in the side yard to build a bog garden that would not only contain the bog but also serve as a nice focal point in the yard. However along the way in building the blog my wife introduced a new wrinkle when she said, "That would be a perfect place for a fountain." Overfill and Overspray - the beauty of a fountain within the center of a bog is that any overspray from the fountain or slight overfilling will simply go into the bog. Irrigation - even though I'm in Northern California, my particular region is rather dry and I have to irrigate my bog to keep it moist. Thus I was already running irrigation to the bog so to spit the line to fill the fountain wasn't much more work. Sound - in addition to the cool plants you can grow in a bog I like the added mistique of the sound of water flowing in a fountain. OK, so maybe these advantages don't justify the work involved in building a fountain within a bog garden but it was enough for me to expand the project. What I wanted to create is a non-exposed water collection container (where the pump sits) and the appearance of water pouring into the bog. 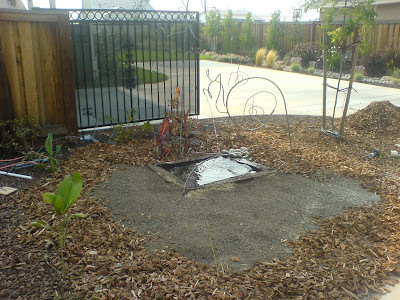 One of the interesting design aspects of a bog garden is that your ground over (e.g. bark or rocks) can blend in seamlessly with the ground surrounding the bog. When complete this hides the boundaries of the bog and no one will even know that there is a bog garden there (other than the different style of plants that grow within). Thus the bog can make people ask, "How is it possible that those plants are growing in regular soil?" In this I dug out the bog garden perimeter by removing 2 feet of soil (2.5' is recommended but I live in a clay soil area and there is a limit to how much digging and hauling of compact heavy soil I'll do). In the center of the bog I dug rectangular shovel wide trench 6" deeper where the fountain basin would sit. My main reason for doing this is to anchor the resulting concrete basin in place. When finished the top of the fountain basin will be flush with the ground. This is keeping with my design that everything is below ground and one can't tell where the bog or fountain begins or ends. The nice thing about this approach is that you don't have to be an expert mason when building and pouring your fountain basin. I then cut plywood planks to frame the outside of the basin and another box for the inside. What you're doing at this stage is building a form for the concrete to rest in while it cures. Wet concrete has the consistency of oatmeal that has set out for too long. It is moist enough that it will form itself into any form it is placed but it isn't wet enough that it seeps out of small cracks or holes. Thus the goal here is to build a temporary form for the concrete to sit in until it is hard enough to remove the form. Visually imagine that you're building a box with no top or bottom. One box for the outside walls and another smaller box for the inside walls. The important trick here is to build the frame so that it can be pulled apart after the concrete dries/cures. 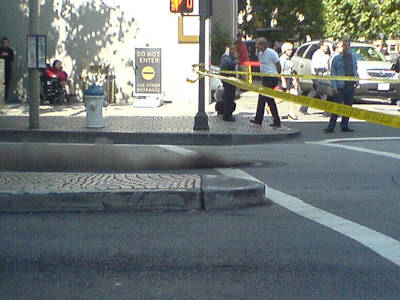 Once the concrete hardens you won't be able to get to anything covered by the concrete (e.g. screws or nails). So build your frame with an awareness of how you'll pull it off of the form once the concrete hardens. I then covered the entire bog with a pond liner. This is clearly the most expensive single construction material you'll purchase for this project. Stop by your local hardware supply store and see what sizes and prices they have for pond liners before designing your bog garden. 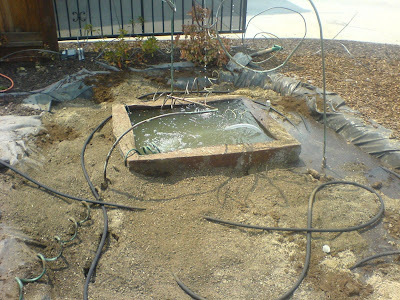 You can glue multiple pond liners together for particularly large or odd shaped bog gardens (even though bog gardens do naturally drain into the underlying soil via holes placed in the liner you must glue overlapping seams or too much water will escape). The next step was to set the outer frame in place and pour in the foundation for the basin. The design for my fountain involves automatic filling (I tied mine into my irrigation) and the water exiting the basin via a 3/4" pipe. As such I designed my frame form with openings for these two pipes so that all of the water management was underground within the concrete basin itself. I used regular concrete but if I were to do this project again I would mix in a small portion of plastic cement into the mix for better water retention. After pouring the foundation (8" deep) I inserted the inner frame and started pouring the side walls. The walls of my fountain basin are about 8" wide which had more to do with erring on the side of simple frame construction rather than any hard facts about how thick the walls need to be. Make sure to get enough concrete to do the job because those short trips to pick up a few more bags of concrete can present leaking problems where a new pour is placed over an existing. Once the concrete basin cured I removed the frames and tied in PVC tubing to the exit pipe via a T connection. From this I ran 3/4" PVC pipe around the basin and tied it back into the other end of the T connection (a single continuous loop). At various points along the route I installed additional T connections with threaded openings pointing up. These threaded connections hold the copper tubing in which the water will flow out of the fountain. Similarly I connected the other PVC pipe to my irrigation system. 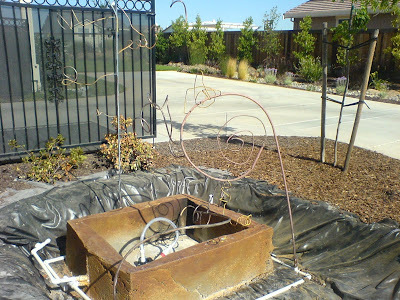 My aim was to build a whimsical fountain consisting of copper tubes that took water from the underground basin up and through multiple pipes poured the water back into the basin. I knew that if I simply took copper tubing and ran water through it that the sound would be too loud and it wouldn't be much fun. And I wanted the design to have a purpose for existing in a garden. I started with 1/2" copper pipe and started by soldering threaded connections onto one end and a cap onto the other. 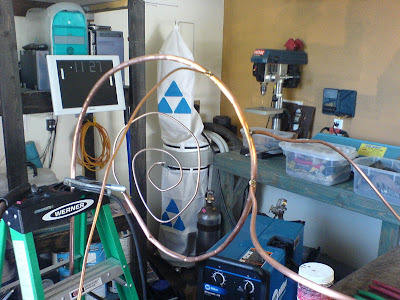 Each 10' copper pipe was then free form bent into random designs using a pipe bender. You can get a pipe bender at your local hardware store. Make sure to get one for the diameter of pipe you're bending as this will give you a much smoother curve with fewer bends (e.g. if you applied pressure to two ends of the pipe you would simply bend it rather than forming a curve). If you don't know how or have access to someone who can weld copper then you'll want to skip the next step. 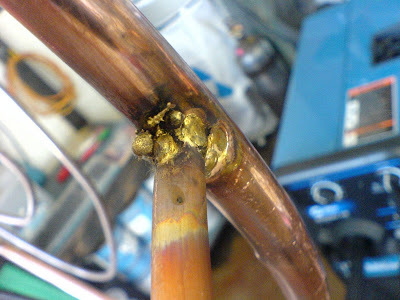 Someone skilled at brazing might be able to make the connections but if you don't succeed you'll have holes in your tubing that under pressure will squirt water where you don't want it to go (e.g. across your yard). 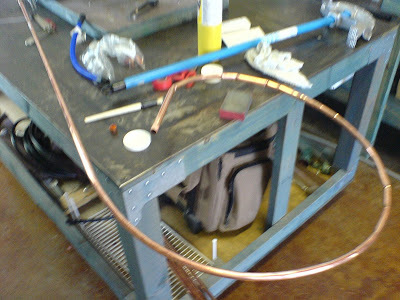 I then drilled holes into the pipe and welded on a small diameter copper tubing. This tubing is available from your local hardware supply store. You'll recognize it as the copper tubing that runs to your water inlet on a refrigerator ice machine. The flexible nature of this copper tubing allows you to move, twist and contort it into a variety of positions for a cool look and to direct the water where you want it to land. 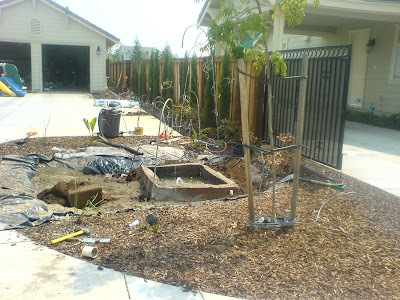 After building each fountain piece (I built three in the shape of plants with a large daddy, medium mommy and small baby) I carefully turned them into the threaded PVC "T" connections and supported each one by hammering in rebar and wrapping copper wire around the pipe. 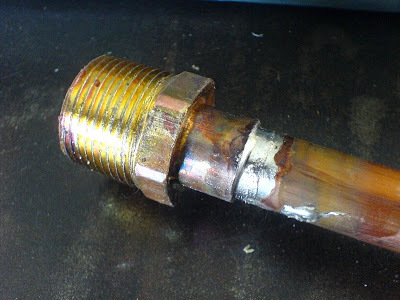 The PVC threads are easily damaged by the harder copper threads so be really careful when screwing them in. 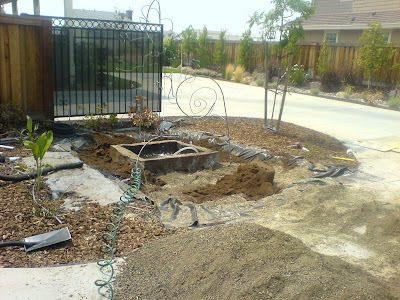 Once the fountain pieces were secured and plumbed it was time to start filling in the blog. I chose a mixture of peat moss, top soil and sand. About 2/3 of the way in filling in the bog I snaked a soaker hose throughout the blog after attaching it to my irrigation inlet. This will soak the blog slowly each time I turn on the irrigation for the pond/bog valve. Once the fill for the bog was complete I topped the surface with bark to match the surrounding garden. You can also see my first bog plant behind the fountain. Part II of this post will include adding decorative rock around and in the bog to finish off the illusion of a hidden bog and fountain. I'm now starting to formulate ideas about what to do with my gear contribution. 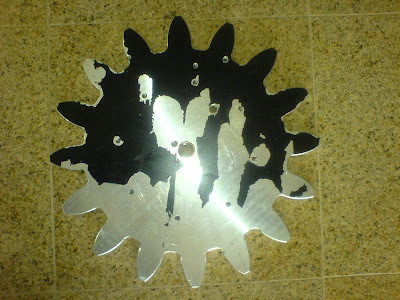 Each gear will be incorporated into a moving kinetic sculpture. The hope is that our fundraising will help with Todd's recovery and that one day he'll be able to crank the sculpture on his own. I should add that I don't know Todd nor have I any relationship to the organization he works with. I discovered his situation upon viewing a Laughing Squid Tweet and committed myself to the cause after hearing his story. So let me know your ideas for the gear! What do you think I should to to it? 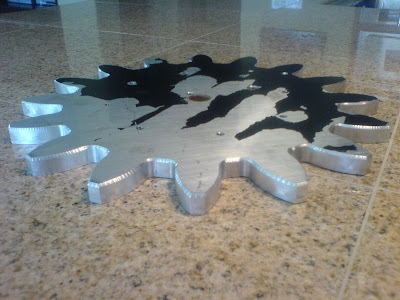 I know that I'll be grinding/polishing off the black paint and can make it 3-dimensional by inserting threaded rod into the pre-drilled and pre-threaded holes in the gear. But what I weld onto those rods is still up in the air. 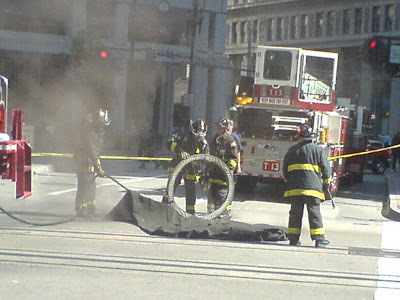 After picking up my gear for the Todd Blair project I was walking towards Market street when I heard a huge explosion. 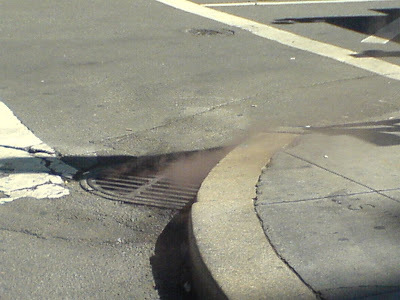 As I turned the corner there was a thick black smoke pouring out of the manhole covers. In order to be "creative" one must have a creative space. As with most Americans, the luxury of a true studio escapes me so I've built my own in my garage. With our new house I took advantage of the 3rd car bay so that I can park both cars in the garage and still have a workspace to get creative. I've fitted my "studio" out with a workbench running along the West facing wall complete with a drop in miter saw and dry cut saw as well as a brake press and drill press. The design for this workbench can be found in Family Handyman Magazine. The combination of tools installed on my workbench allows me to cut, bend and drill almost any wood or metal object without getting out any tools. Since both saws are dropped into the bench all I have to do is slide the object into place and make my cut. Not shown here is a vacuum system which is plumbed to both saws from underneath the workbench (the end of this vacuum line goes to an air intake vent built into the end of the workbench on the floor for a high school shop class style vacuum system for sweeping in debris). The vacuum system captures the wood dust that is kicked up when you make a cut. I'm not sure it does much good underneath my dry cut saw (for cutting metal like butter) but I dropped a line there too. At the end of the bay I had the builder pre-install 220v electrical outlets for my MIG welder and compressor. They're on separate circuits so I could upgrade to plasma in the future (requires forced air and welding at the same time). Not shown here is my 4' x 4' workbench on casters affixed with a 1/4" steel top. Using this mobile workbench I can move my work surface to wherever I'm at to work on a project. 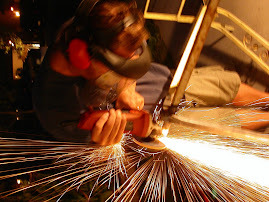 Since it is on wheels I can even wheel it out into the driveway if I need to work on an outdoor project or weld something that puts out noxious fumes (such as welding steel and copper together using Aluminum Bronze filler metal with an Argon Shielding Gas). The storage shelves in the center of the bay also house an old Macintosh that I use for our family's music archive. Instead of everyone maintaining their own iTunes repository of music, everyone's Mac is setup to look at this studio Mac Server for the iTunes files. Word to the wise: when building your house run coax and ethernet lines to your workshop. It only costs a couple of bucks when the walls are exposed but provides you with a lot of options when you're bringing entertainment to your studio. I'm able to listen to my entire music library while working in the garage with this configuration. 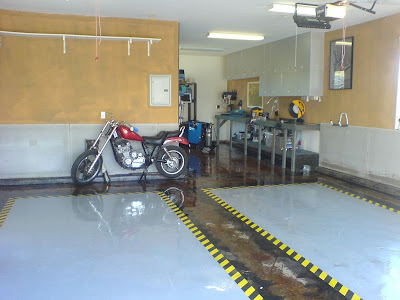 The floor is regular concrete sprayed with two (brown and black) acid stains and sealed with a concrete sealant (the floor is wet in the photos, not normally this shiny). I've also attached concrete board to the lower half of the walls. 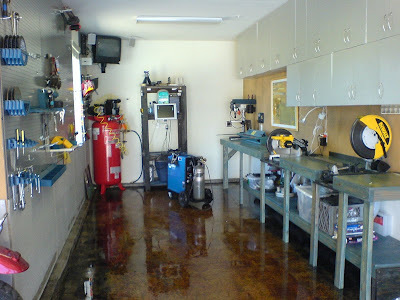 The combination of the patina floor and concrete walls makes for a perfect workspace if you weld, grind and cut. Any hot embers that burn into the floor (doesn't look great on an epoxy floor) simply adds to the design and is not noticeable. Also the concrete boards along the baseboards act as quasi fire protection. I should add that this is a working studio/workshop and it normally isn't this neat and tidy. I took these photos during a cleanup day while everything was out in the driveway. However with the storage that I've put on the West wall and the pegboard on the East wall (it has a faux stainless steel finish that look great atop the concrete boards below) everything has a home. The cutout areas for the cars to park have an epoxy floor (no welding here) and non-slip safety tape (available at Grainger) border.